Julie’s teacher tells her that the Moon is currently positioned directly between the Sun and Earth. Which phase of the Moon will Julie see tonight? Mel draws a diagram that shows the direction of the sunlight on Earth and the Moon during the different phases of the Moon. 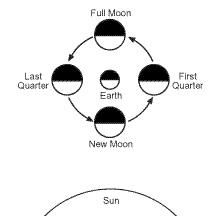 Which diagram below shows the correct location of the phases of the Moon? The diagram below shows the relative positions of the Sun, Earth, and the Moon during the different phases of the Moon. Which two numbers show us crescent moons? Wilbur makes a science model to show the relative positions of the Sun, the Moon, and Earth during a full moon. Which arrangement shows their correct positions? 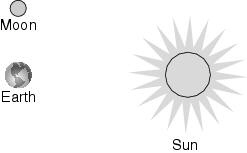 The diagram below shows the Moon, Earth, and the Sun in a certain relative position. Josh is learning the various phases of the Moon. He observes a full moon on a particular night. About how long should he wait to observe a new moon night? 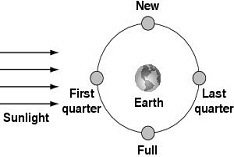 Graham is making a model that shows the different phases of the Moon as it revolves around Earth, as shown below. Which position shows the Moon in its waxing phases? Kerry draws a diagram to show the relative positions of the Sun, Earth, and the Moon during the different phases of the Moon, as shown below. Which phase of the Moon should he draw at position 6 in his diagram? the model showed an eclipse. the Sun was not in the model. 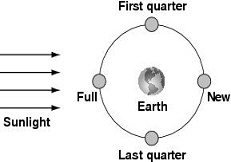 How long does it take for the Moon to complete one rotation?